I awoke to the sound of foghorns from ferries passing through Thatcher Pass. When I looked around, I saw almost nothing. Visibility was just around 200 feet. After an hour or so it began to lift, and I headed off. The current in Thatcher Pass was ebbing so I got a nice boost in speed. The fog had lifted much; visibility was maybe 200 feet. Radar was a must have. 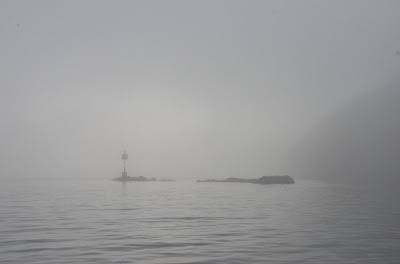 In Rosario Strait I stayed close to Reef Point on Cypress Island to avoid the ferries. Only one other boat on the radar screen the whole way across, except for two ferries. By the time I got inside of Guemes Channel the fog had lifted and the sun was out. I fought a strong current through Guemes Channel, but eventually made it through to Twin Bridges. More big boats going fast in Swinomish Channel, and again, massive wakes. Thanks to my scrubbing of the bottom in Barkley Sound, growth on the hull was minimal. The trim tabs and bottom of the engine mount were a bit of a mess, but not too difficult to clean up. I unloaded the boat, scrubbed everything down well, and headed back to Seattle.